Koko, the gorilla who mastered sign language, died at the age of 46. Koko, the gorilla who mastered sign language and became a pop-culture phenomenon, will be laid to rest Saturday in a ceremony at an animal sanctuary in Northern California where she lived for decades. The western lowland gorilla died in her sleep Tuesday morning at the age of 46, according to the Gorilla Foundation, which is headed by animal psychologist Francine "Penny" Patterson, who worked with and cared for Koko since the primate was a year old. Koko was renowned as one of the most intellectual apes in history, beloved by millions of people around the world. Under Patterson's tutelage, she learned more than 1,000 words in sign language and came to understand over 2,000 words spoken to her in English. "She taught me more than I taught her, for sure," Patterson, 71, told ABC News in a telephone interview Thursday. "She had opportunities to show her brilliance and that’s what we saw. We saw a person, really. She had all the attributes of a person and then some." 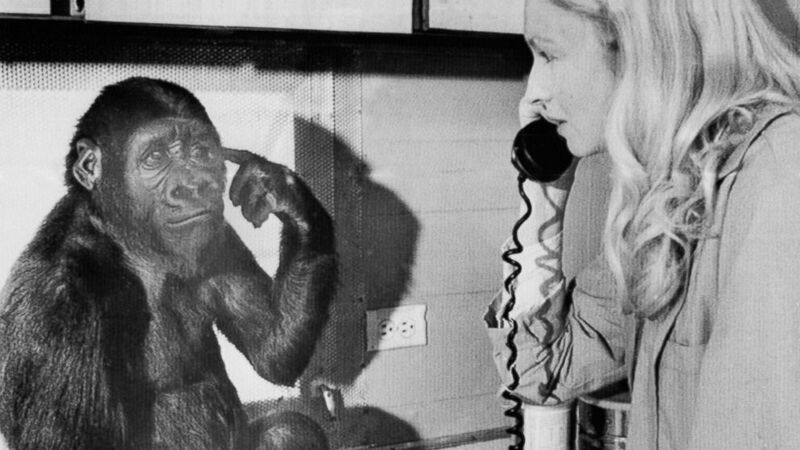 (Bettmann Archive/Getty Images) Koko the gorilla uses sign language to tells graduate student Penny Patterson she wants to listen to the phone, Feb.27, 1975. Koko will be buried at a grave site on the Gorilla Foundation's seven-acre preserve in Woodside, California, alongside Michael, a western lowland gorilla who was rescued from poachers in Cameroon and came to live with Koko at the sanctuary. He was originally Koko's intended mate, but the pair developed a close friendship instead, according to Patterson. "They were great playmates and companions. They were good together, and she loved him so much," Patterson said. "It just feels right to have them close." Patterson said Koko looked "peaceful" after she died, when Patterson arrived to be by her side. "We’re still trying to understand what the cause was," Patterson told ABC News. "Many gorillas have a heart condition, cardiomyopathy, and she had it, but it was apparently a mild case and was being treated for that. That’s one possibility." "She was looking a little sad and worried, and she looked straight at me and held two signs," she said. "One was ‘patient’ and the second one was ‘old.’ So she was trying to explain, 'Hey, I’m getting on.'" 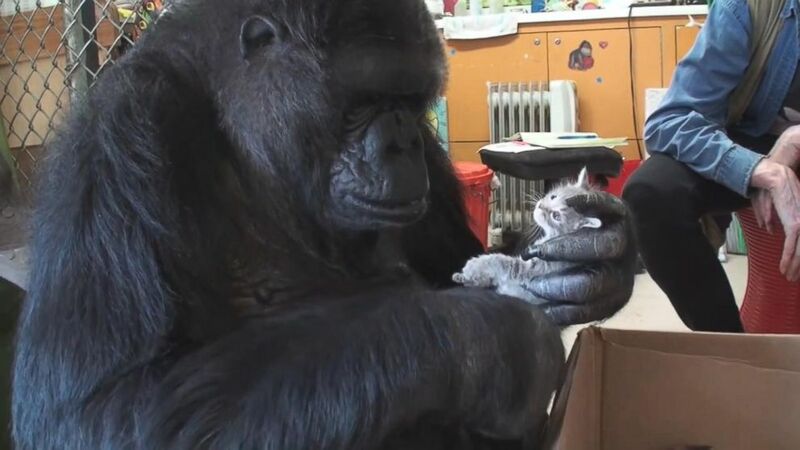 (The Gorilla Foundation/Koko.org, file) Koko the gorilla holds a kitten. Saturday's funeral and burial ceremony will take place near Koko's dwelling so that the organization's other gorilla, 36-year-old Ndume, can "see the whole thing and participate," Patterson said. Patterson recently took Ndume to see Koko's body to help give him closure. "He's sad," she said. "When he came to see her, he brought some blankets. He brought a chair, he brought his favorite barrel and he arranged her blankets so they were off of her and around her. And then he sat on his barrel and he could see that I was sad, and he signed, Know.’ ‘I know.’ Basically, he was telling me he knew what happened. And he also signed, ‘cry,’ which, of course, is what we’re doing." Born at the Cincinnati Zoo, Ndume was also brought to the sanctuary to be Koko's mating partner. Koko did get pregnant but had a miscarriage. The two remained close companions after that, according to Patterson. "I think that's one of Koko's deepest regrets is not having a baby," she told ABC News. Koko's beloved cats, Ms. Gray and Ms. Black, whom she "adopted" in 2015 and considered her offspring, will also be at Saturday's ceremony, along with volunteers and staff members of the Gorilla Foundation who helped care for Koko. "It's really a celebration of life," Patterson said.